Here is another recent find. 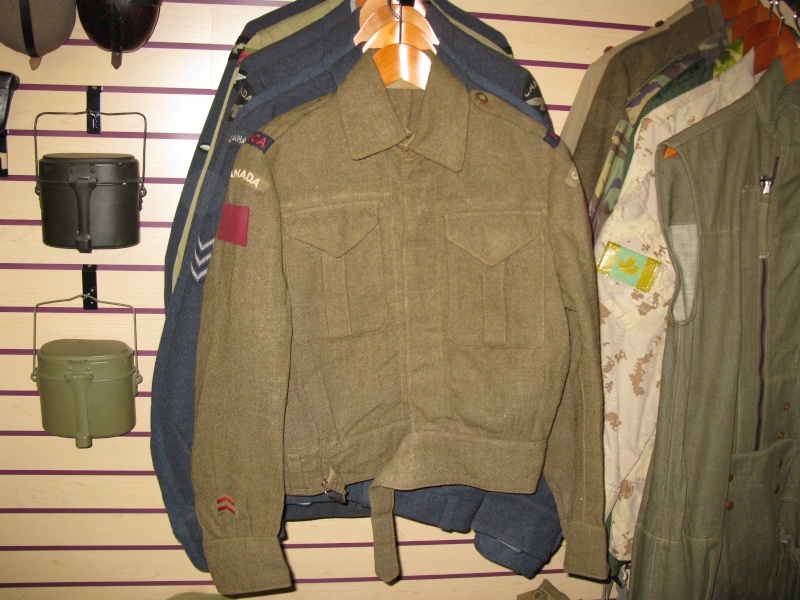 A small size but nicely badged to the 8th Field Regiment (SP) RCA and with British made curved Canada titles. 8 RCA used Sextons at one point and fought in Italy along side the British 8th Army. Still doing research on this unit in order to compile a brief history that I can store with the tunic. I've decided to do this will all of my uniforms which should keep me busy for a little while at least. Looks good from here. Any chance of us getting to see a picture of the entire blouse? Yes, it would be possible, but since I have to use my own image host I really don't want to waste bandwidth to show something common such as a BD tunic. Do you understand what I mean? To me, the interesting part is what I have already shown. Just image those insignia on a complete tunic and that's what it looks like :) However, I am willing to send a photo to your personal email if you like. Don't worry about the bandwidth, go ahead and post the pics if you want. Your choice though. Well, it's not your bandwidth that is the issue, it's mine. I have a limited amount of bandwidth each month at my image host which I am using because there is no option to upload photos on this forum that I am aware of. Or am I missing something? We do have a picture host here...not one that I would choose myself, but it works. Try it out in the test section if you like. Looks great to me! Every BD has a story to tell. I also really like your methods of display. Looks very professional. Also, now that you are signed up on Servimg, you can you them to post pictures on other forums as well...I do it all the time. Great looking blouse. Any name or number inside? Written in pen is HAWKES MG. I wish there would have been a number so that I could have confirmed things, but after a close examination there is no doubt in my mind that everything is original to the tunic. Infanteer90 wrote: Written in pen is HAWKES MG. I wish there would have been a number so that I could have confirmed things, but after a close examination there is no doubt in my mind that everything is original to the tunic.